Strike-Zone Tournament Baits is a small company specializing in hand poured finesse baits. The signature Slammer is a popular drop shot bait amongst Canadian anglers, and its popularity has been spreading across the US. A new 3" version (called a Mini Slammer) was recently released. I had the chance to test it out for a variety of species. The bait is made from a mixture of plastisol, salt, and a buoyant material that makes the bait naturally buoyant. It is quite durable when compared to other soft plastic baits on the market. However, you may go through a bunch because nose hooking the bait is one of the best ways to rig it when drop shotting. The lightly hooked bait often gets thrown off the hook when bass jump. In my opinion, its worth losing the bait every time if you're getting the bite that counts! Mini Slammers are available in an unreal assortment of amazing fish catching colors. Many of the colors have been tailor made for specific bodies of water. These baits are made and tested by top tournament anglers who know fishing. I feel this is why there has been so much emphasis on the attention to detail on these baits. A huge 7lb 10oz smallmouth that was caught with a Mini Slammer. This bait is very easy to use. I fish with many beginners when guiding, and this is one of my go to baits - especially with first timers. It is so easy to use that its hard to fish it wrong. The bait makes first timers fall in love with fishing. There are so many effective ways to rig and use this bait, but the most popular has be drop shotting it. This bait catches everything that swims. I've caught carp, musky, pike, bass, panfish, walleye, lake trout, whitefish and drum. I hear the same story from many others. When the bite is tough, it's hard to beat the Mini Slammer. When the bite is hot, it's also hard to beat the Mini Slammer. This bait is a fish catching weapon, period!! 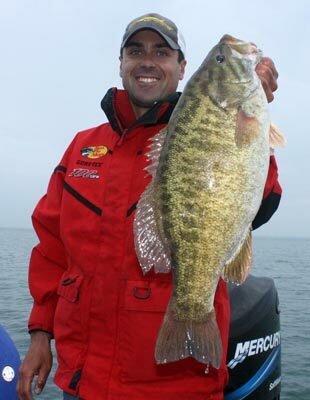 My friend Paul C. from Cast Adventures recently caught a ridiculous 7lb 10oz smallmouth on this bait! Just because its small doesn't mean it can't catch monsters. There are plently of dropshot baits on the market, but none of them have the same enticing action. The combination of the grooves in the body and the slight paddle on the tail make this bait jiggle and vibrate in the water with the slightest motion from your rod tip. The bait is definitely worth the price of admission and then some - plain and simple! If you are a tournament angler it will help you win money, if you are a novice it will help you catch a fish of a lifetime. The new Mini Slammer is a welcome addition to my drop shot options. It's especially important when fish are keyed in on a specific size of bait fish. The Mini Slammer has the same action as the larger version, and can produce fish that are just as big!